Apple wants us to believe warped 2018 iPad Pros are business as usual, but there's no way to justify that. It turns out there may be a “bendgate” for the iPad Pro, after all. On Wednesday, Apple confirmed to The Verge that some iPad Pro models shipped with a slight bend, but the company claims this isn’t a defect. The problem seems to affect cellular models more than regular models, and that this is all simply part of the cooling process, Apple says it shouldn’t worsen over time. It’ll be fine! Everybody go home. What a crock. What an embarrassment. I said last month that I personally had no problems with warped aluminum on Macworld’s 12.9-inch iPad Pro, and that continues to be the case. I'm still ready to believe the problems may spring from a bad batch of iPads. But that doesn't justify Apple's response. After Apple acknowledged that there is, in fact, a problem, it defies belief that Apple would essentially claim it’s no big deal. Considering what the iPad Pro is used for, a bent chassis potentially makes the tablet useless. At this point, there’s little doubt that the problem is extensive enough to warrant serious attention. Right now Apple is reportedly letting buyers take home replacement models within the 14-day replacement window, but it’s not clear whether you can still get a replacement after that without paying something, even with AppleCare+. We’ll soon find out. A Macworld reader named Zach bought his 2018 11-inch iPad Pro with Wi-Fi in November, and he discovered that it’s slowly been bending through everyday wear and tear. He sent us some photos, showing an iPad Pro bent in the middle with the crease extending downward from the camera. I personally would never like working on an iPad Pro in that condition. “The only thing I have been doing is occasionally transporting it short distances in my backpack, and never with anything heavy against it,” Zach said in a message to me on Twitter. Zach plans to take his iPad into the Apple Store for an exchange, and I’ve asked him to give me a report on how that goes. As a reminder, Apple said some iPad Pros were shipping with bends straight out of the box. Zach’s case is a little more complex in that his iPad Pro started bending after he bought it, but I’m convinced these problems spring from the same faults in the manufacturing process. In any case, a warped iPad will certainly negatively affect the user experience. 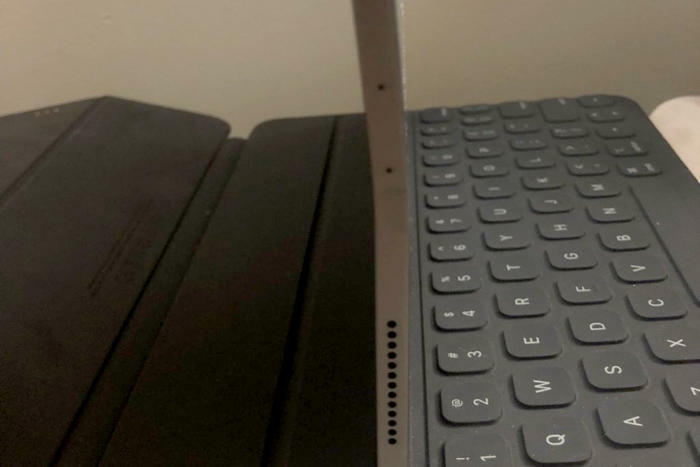 After all, Apple designed the latest iPad Pro to work with its new Smart Folio Keyboard, which wraps the tablet so neatly that you may think the case is part of the construction. That wouldn’t be as evident with a warped tablet, as you’d see clear gaps between the tablet and the case. You won’t see it looking as neat as this, in other words. A warped chassis could possibly even affect the Apple Pencil, which is designed to rest on magnets along the tablet’s side. 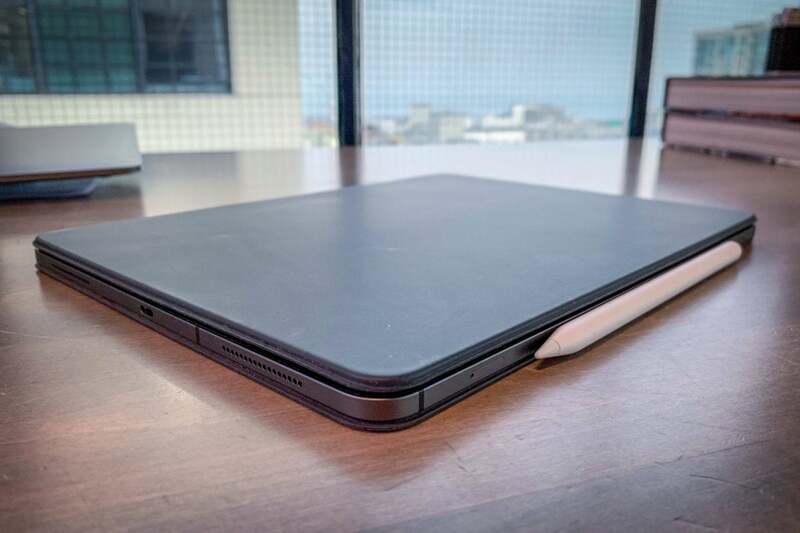 Depending on the location of the bend, a warped iPad would both keep the Pencil from wirelessly charging properly and make it less likely to stay attached to the tablet in transit. But there’s a more damning reason why Apple can’t justify shipping a warped iPad Pro and calling it “fine.” It utterly ruins the experience of writing and drawing with the tablet. Apple sees the iPad Pro as a fantastic tool for artists and students, who would typically use the tablet to draw or take notes while the iPad lays flat on a tabletop or desk. But that wouldn’t happen with a warped iPad Pro. You’d always have one end of the tablet that’s too high or too low, and a bend in the screen would ruin the intended effects of brushstrokes or handwriting. It’d almost be like painting with a warped canvas, and I spent enough years in the art industry to know that isn’t ideal. And I get annoyed enough when I have to write longhand on a legal pad with a crease in the paper. Why would Apple ever think anyone be happy with a $799-plus device with a permanent bend right down the middle of the screen? At the very least, Apple should understand that the appearance of Apple devices is one key reason why many people prefer them over the competition. They simply look better. All that appeal and magic goes out the window when you place a warped slab of aluminum and glass on the table of the boardroom. That doesn’t command respect or envy—it prompts ridicule or envy. I understand why Apple might want to try to play up these defects as something we can live with. There’s the specter of the first “bendgate” with iPhone 6 and 6 Plus, of course, but there’s also the concern that some chump who’s got some other kind of problem with his device could bend his iPad and claim it was like that all along. For that matter, the news comes on the heels of several weeks of falling stock prices, and something like this could only mean further problems. If the problem is as prevalent as it’s starting to seem—again, I’ve yet to see it on my own device—it’s something Apple needs to address. For that matter, it needs to put a replacement program in place right now. The video from JerryRigEverything that first suggested that the new iPad Pro bends easily. It also warrants some serious concerns about Apple’s production process. How did this happen even after all the bad press and lawsuits surrounding “bendgate?” Armed as it was with fresh memories of that controversy, why didn’t Apple take every step possible to ensure that it didn’t happen again? How did this happen, considering that the aluminum used for the iPad Pro is new and not recycled, as it is with the new MacBook Air? Here’s to hoping the problem actually isn’t all that extreme. After all, back in 2014, Apple claimed that only a few people had complained of having bent phones (although I was one of the people who had one). In any case, having acknowledged the problem, Apple should make it easy to get a replacement. Right now, it’s not really clear that’s the case, as Zach points out.